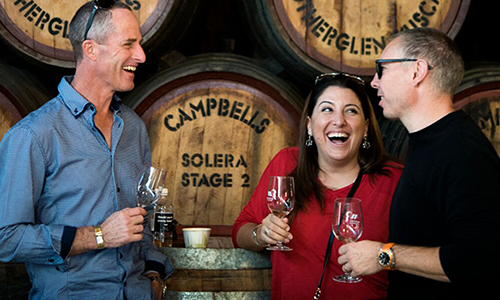 Winery Walkabout 2019 is an event filled with fun, great food and Campbells wines! Guests can relax on the winery lawns and listen to live music or step inside and experience our 148 year old cellars filled with barrels, to taste and discover a selection of our distinctive regional wines. If you’d like the opportunity to taste a select range of back vintage treats from our family cellar, then don’t forget to join our ‘VIP’ tasting experience. Entry to our VIP area is $20pp or free for Cellar Club members and one guest. We hope to see you here to celebrate the beginning of winter and all that it has to offer!